I wore this on a cool, rainy day last week. While I would have loved to stay home and watch movies all day, I had to go to work. Since I couldn't actually be lazy, I at least wanted to keep my outfit cozy! 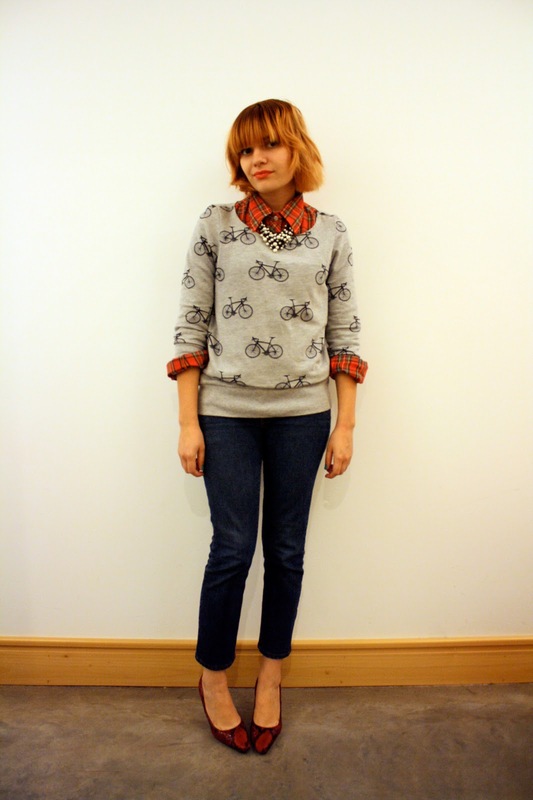 This cute, quirky bicycle sweatshirt and some casual plaid provided the perfect solution. I love this look! Seriously one of my favorites of yours (Along with the London Look). Pearls + mixed patterns, slim jeans and heels = recipe for awesome. Way to make it amazing! That is such a cute sweatshirt!! I wish I saw that at my UO for $5. I would've bought it in a heart beat! Definitely cozy, but still fun at the same time! really cute and comfy look! Love it! So chic for fall, love the mixing of prints as well! I adore this outfit! The layers perfefctly and the necklace looks great! I have to agree that this is one of my favs! Love your shirt. The bicycles are just super cute and you do look super comfy. I love this! 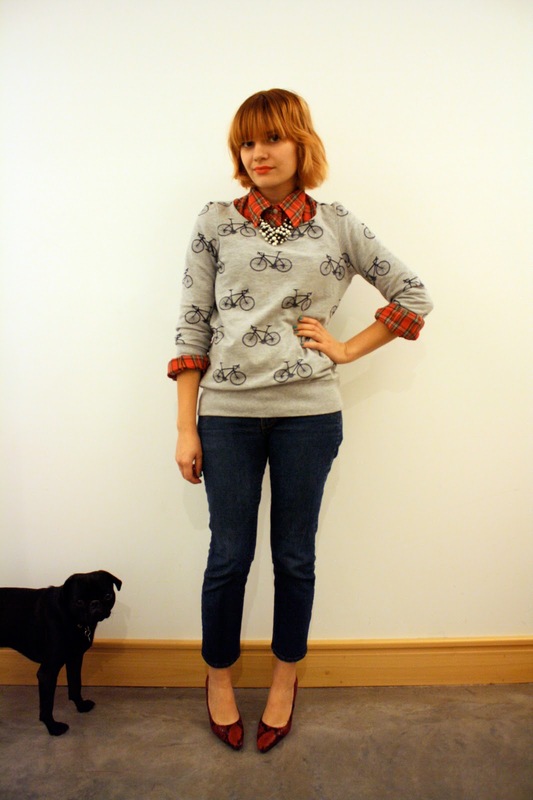 Its the perfect fall ensemble, but the bicycles keep it quirky. Love. Bikes and heels, perfect! And I love the orange lipstick. Looks amazing you. Such an adorable little sweater! It really makes a statement in a unqiue and fun way. I love how you layered it, and polished off the look with the statement necklace. It all looks so complete, yet casual. Thanks for sharing! Love your shoes. Is that python print? I like that last piccy with the canine. Classic. 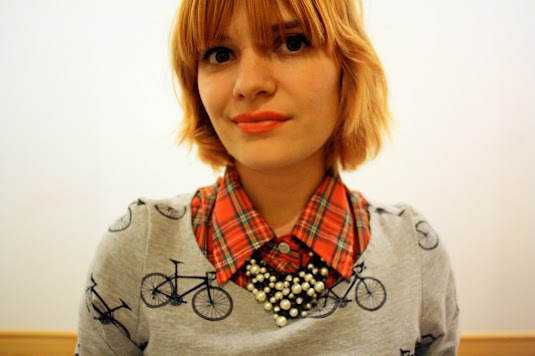 I love the print mixing in this outfit with the plaid and cute bike print. So cute. Oh ! How cute is it ! The sweatshirt is so wonderful ! !